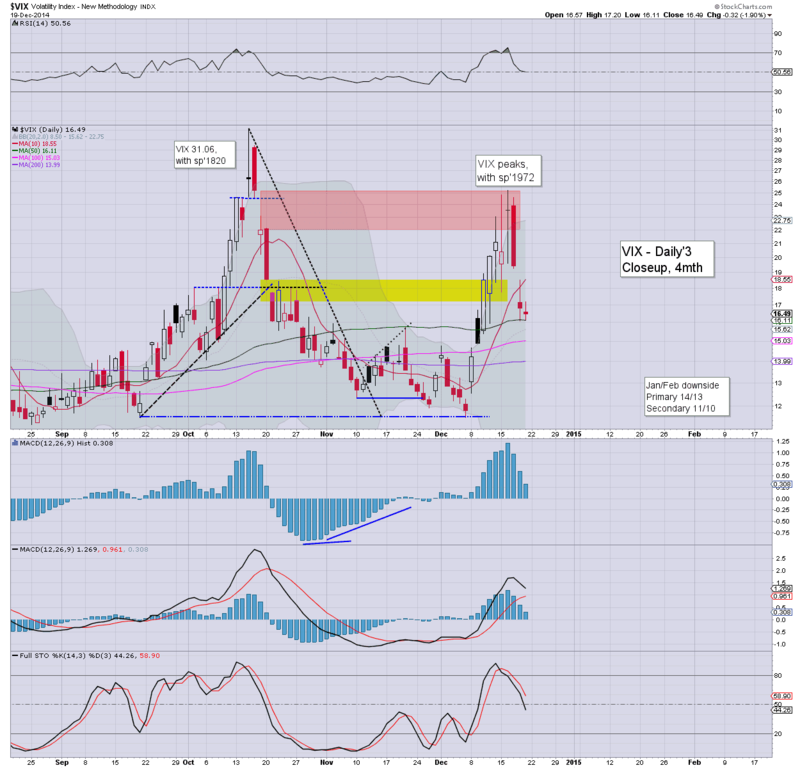 With equities seeing renewed strength into the weekend, the VIX continued to cool, settling -1.9% @ 16.49. Near term outlook is for VIX to fall into the 12/11s.. perhaps even 10s - with sp'2100s in January. Across the week, the VIX declined by a very significant -21.8%. *the third consecutive net daily decline in the VIX. Higher equities.... lower VIX... nothing surprising there. 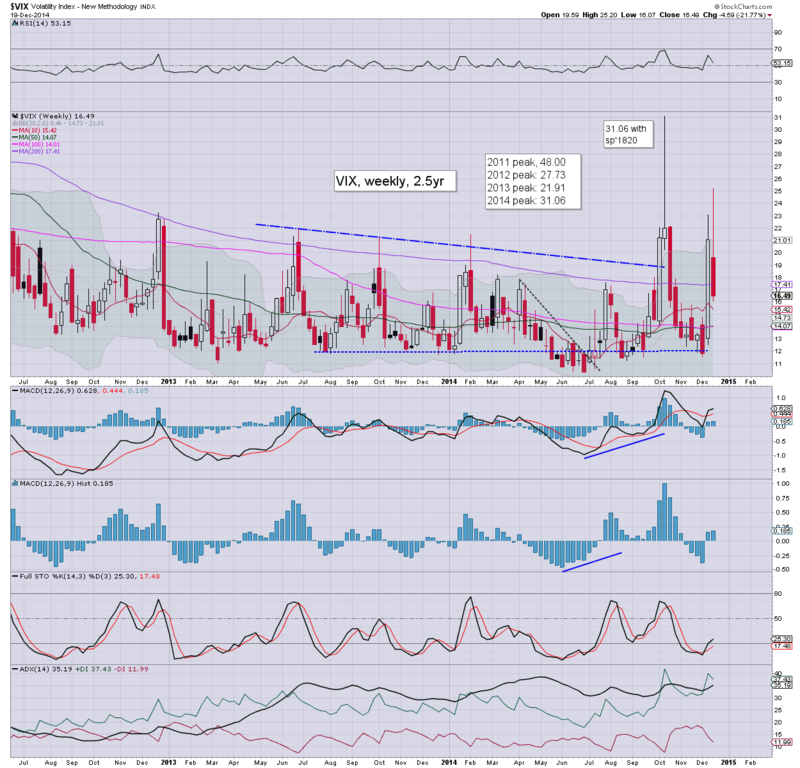 VIX looks set to remain very low for a good 4-6 weeks. The next spike might only get the VIX to the upper teens. US equities climbed for the third consecutive day, sp +9pts @ 2070 (intra high 2077). The two leaders - Trans/R2K, settled higher by 0.4% and 0.3% respectively. Near term outlook is for continued broad gains into end year.. and beyond. 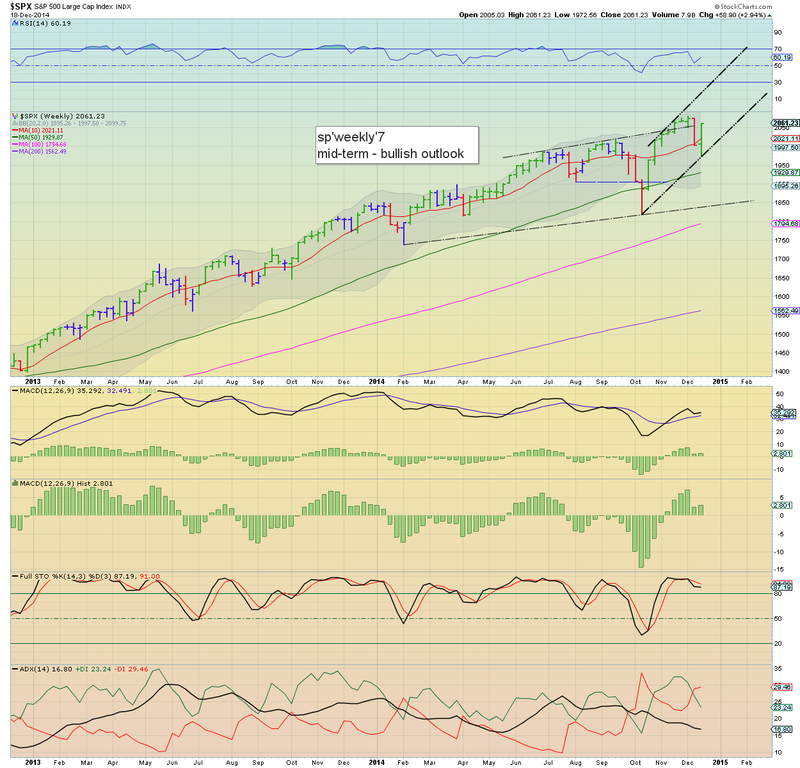 It has been a rather insanely powerful ramp.. from the Tuesday close of sp'1972.. to a Friday afternoon high of 2077. *A full set of postings across the evening.. to wrap up the week. US equities have soared from a Tuesday close of sp'1972 to a recent print of 2072, an incredible hyper-ramp of 100pts across just 3 trading days. It has unquestionably been a week for the equity bulls, with a clear floor of sp'1972... and we're now close to breaking a new historic high (>2079). *1972... to 2072... wow. 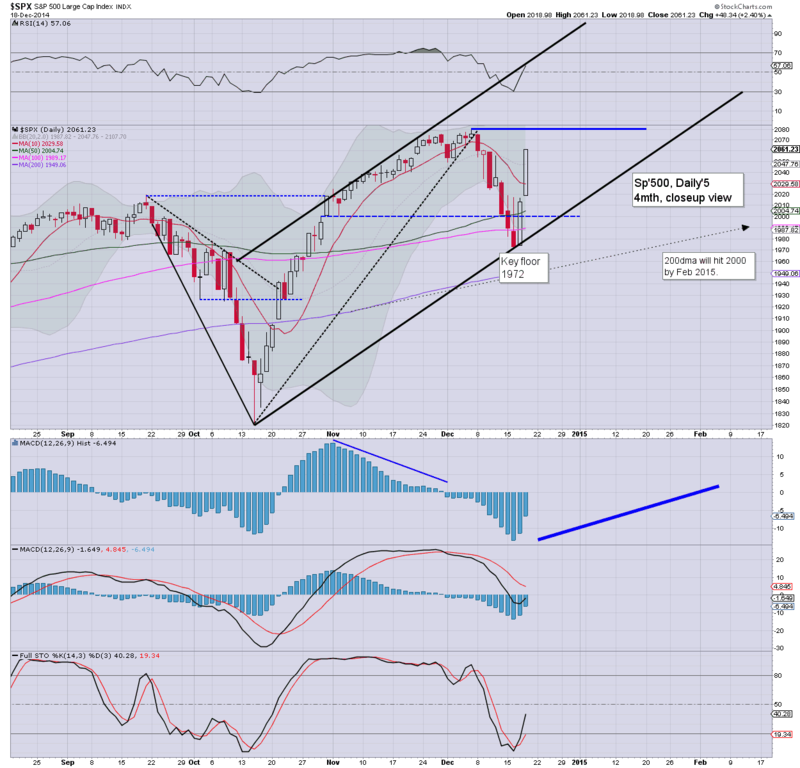 I should note, as of Tuesday night, I thought I was bold in seeking a weekly close of 2030/40. It has been a long week... there is little to add, that hasn't already been said many times. *the only thing I would add.... eyes to the R2K... once it breaks a new historic high, it'll be a major signal of much higher levels. The setup is very much like the Transports in late 2012.. having trading sideways for an entire year.. it then exploded higher.. and never looked back. 3.17pm... Powerful oil gains of 5.7%.. and this is really helping equities hold gains on what would normally be a choppy opex. Notable strength, RIG, +8.3%.. a key mid term floor is in. Whilst the broader equity market is churning into the weekend, there are notable strong gains in Oil, +3.7% . If oil has indeed floored in the $53s (as I strongly believe), then rising prices into early 2015 will be an extra kick for equities, esp' energy sector. Near term outlook is most certainly for continued broad gains. 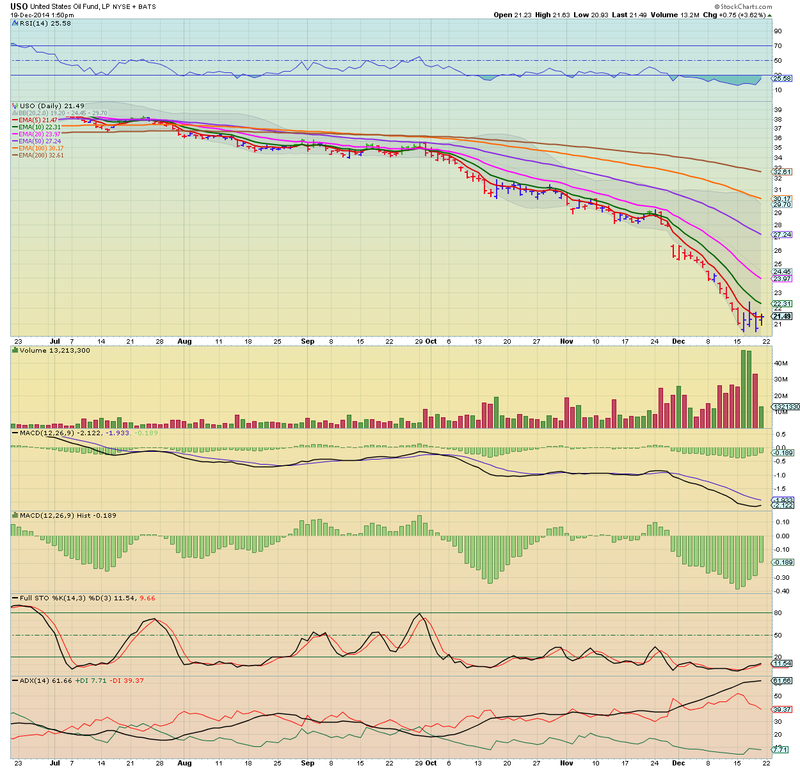 *note the capitulation volume on the weekly chart... highly indicative of a turn/floor. The decline in oil was a major excuse for the down wave of sp'2079/1972... and with Oil having now formed a micro double floor... a very sig' bounce to the low $70s will be a massive boost to both US and world markets. I sure don't think many have remotely considered that yet. Regardless of the weekly close in oil and equities, it has been a massive week for the bulls. Even the Russia market appears to have floored.. with a rather obvious spike-floor. US equities remain moderately choppy, but with moderate gains. Oil is holding notable gains of 2.6%.. having put in a key micro double floor. Trading vol' is naturally going to lighten up into next Wednesday's Christmas eve, which itself broadly favours the bulls. A third consecutive daily gain seems likely, but regardless of whether we close a little higher or lower.. it was unquestionably a week for the bull maniacs. Whilst it remains moderately choppy, the underlying market strength is there to see... not least on the bigger daily/weekly charts. The sp'2100s are coming.. along with VIX sub-teens. Oil is building notable gains of 2.8%, having formed what is very likely a key micro double floor. *metals are weak, Gold, -$1, and price structure remains a very large multi-week bear flag. Gold bugs are in for a real bad time... some time soon. Not much to add... its quad-opex... so.. increasing chop into the weekly close. US equities open to new cycle highs, with sp'2066.. but the market is looking somewhat choppy. Underlying price momentum remains extremely strong. Energy prices are very mixed, Nat' gas -4.5%, whilst Oil is holding sig' gains of 2.1%. So.. choppy open, but then its quad-opex.. and it'd not be surprising to see an entire day of chop. Notable strength in the energy sector... helped by gains in Oil. $20.53 was the first low.... 20.54 yesterday... and now we're safely above the danger zone. 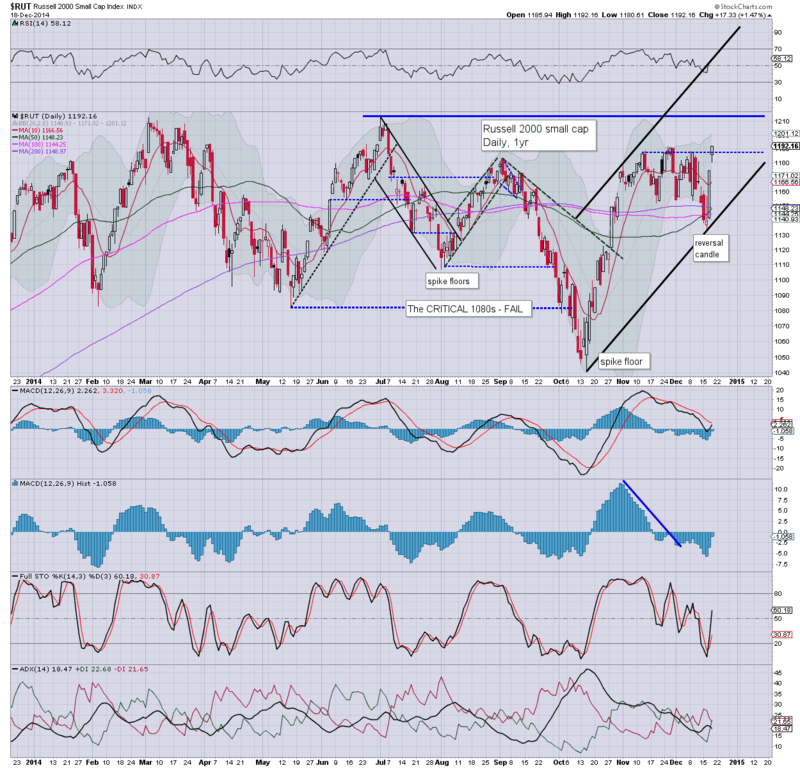 Target upside is 27/30 by late spring... which would equate to WTIC Oil in the mid $70s. 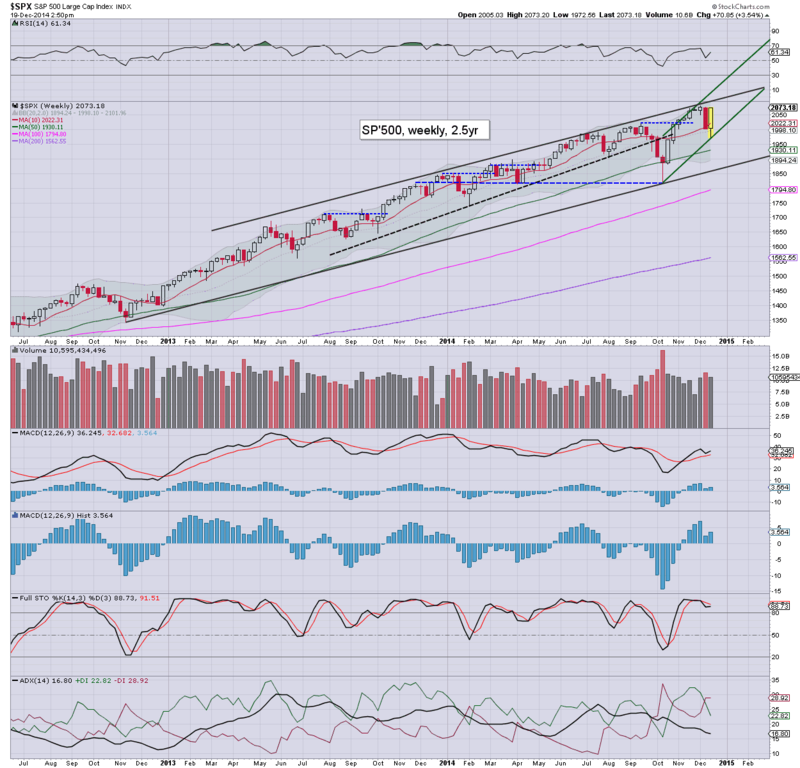 so.. choppy, but we did break to sp'1970. VIX is melting lower.. headed for sub-teens...possibly by xmas Eve. Good morning. Futures are moderately higher, sp +11pts, we're set to open at 2072... a mere 7pts shy of the recent historic high of 2079. Metals are a touch weak, Gold -$2. Oil is pushing higher, +0.7%, having put in a micro double floor. *the above chart was inspired by Disqus poster 'joe trader' last night. The Guppy (who is a chartist who gets a lot of coverage on CNBC Asia) has quite a famous EMA trading system. Anyway, its kinda interesting.. and I thought I'd at least do one chart for it! Today is quad-opex, so expect increasing chop, especially in the closing hour. Fed official Lacker is speaking around lunch time, and any comments on interest rates might give the market an excuse to push lower in the early afternoon. Frankly, considering the size of the gains since Tuesday, those long might well be looking to 'lighten up' this morning.. and perhaps buy back next week. Thank the gods, its almost the weekend... have a good Friday. Whilst US equities continued to powerfully push higher, what remains laughable, but more so... tiresome, is seeing the same old names/sites talk about an imminent crash/collapse wave. 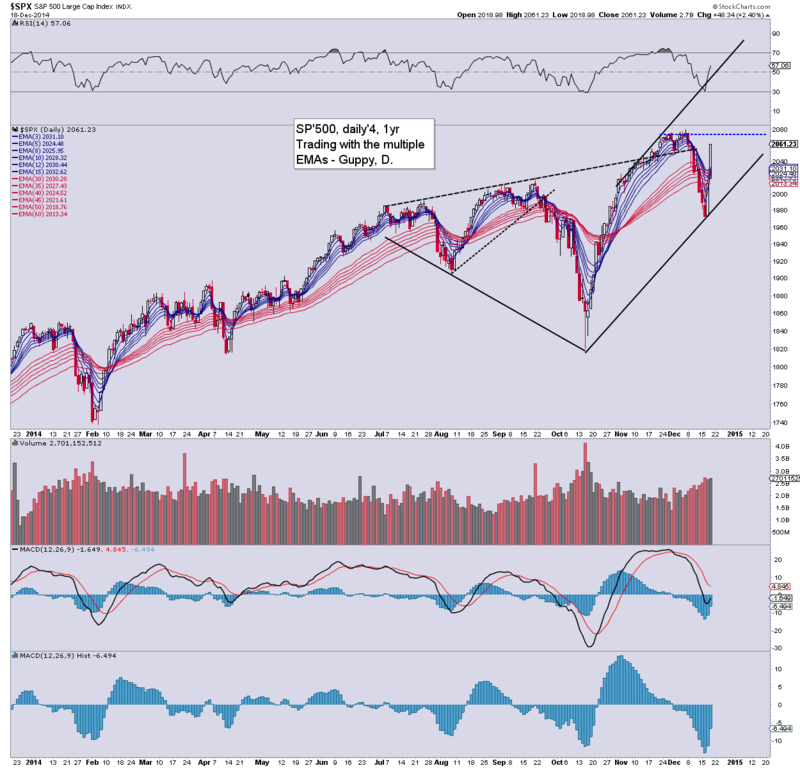 The setup for 2015 is far from perfect, but there are many factors that support huge upside. 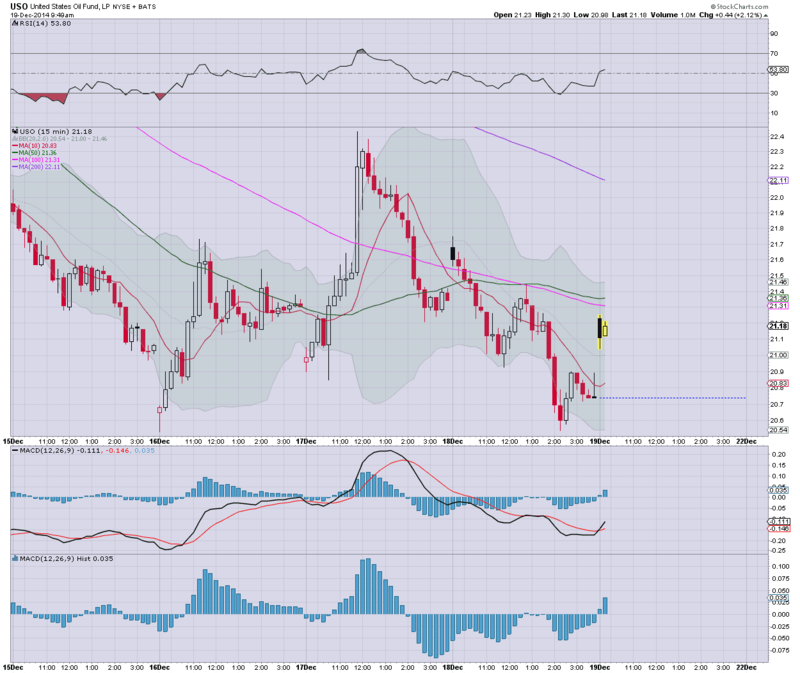 The weekly 'rainbow' candle was red at the Tuesday close of sp'1972... but turned blue this Thursday morning, and with rather extreme strength into the close.. has now turned an outright bullish green. 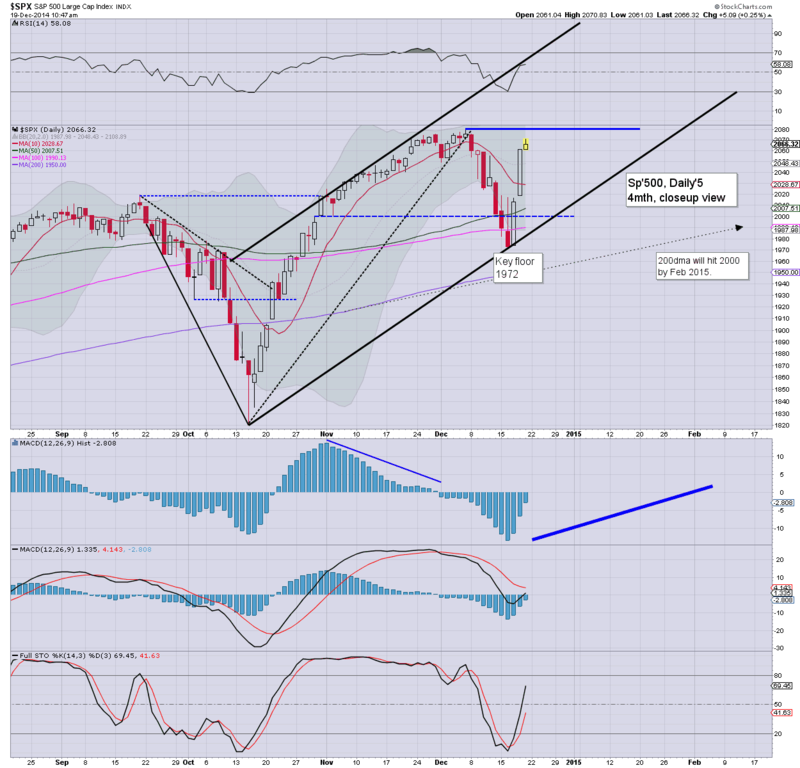 On any basis... the market is back to 'normal service', the sp'2100s are coming. There is no data due tomorrow. There are two fed officials on the loose, but only Lacker appears likely to be of importance. No doubt, any talk of interest rate hikes in the spring/summer would give the market an excuse for another minor intraday down cycle. Friday is quad-opex, so expect some very significant price chop into the weekly close. Maybe I have just been reading around too much in the past few days, but I'm getting real tired of seeing even small amounts of bearish hysteria. It has been pleasing to see some equity bears/traders make some good profits, but still, many of those same people are hyper-bearish for next year. 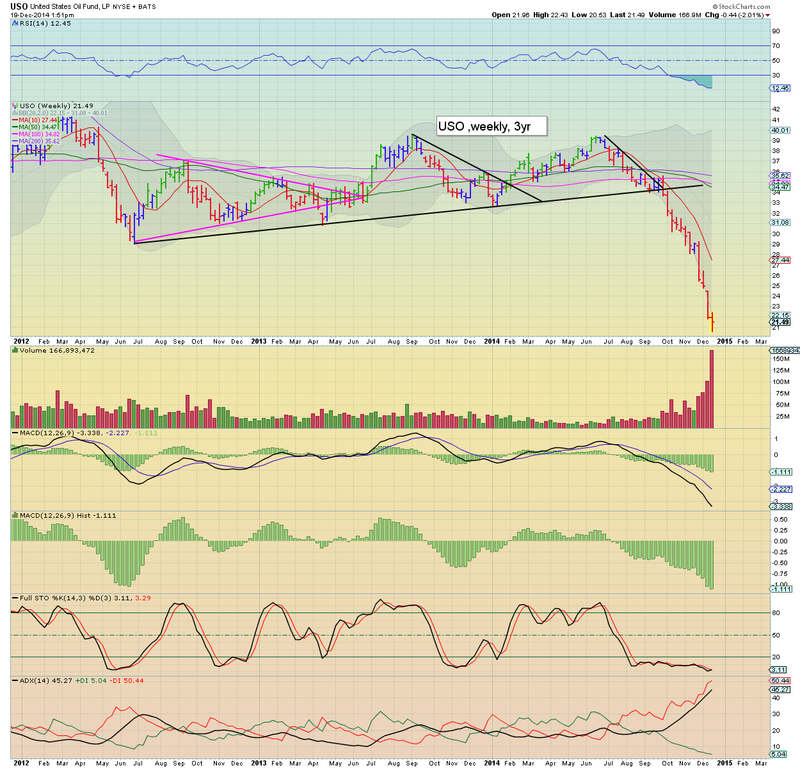 Few seem to have learnt anything since the collapse wave low of March 2009.. or even the more recent key low of Oct' 2011. I'm still hearing endless nonsense talk about how higher interest rates are a bad thing. Tell that to the financials! Then there is the issue of knowing that a fair number of you only want to hear that the market is going to crash. Unlike the maniac 'the end of the worlders' on Zerohedge - who are clearly hyping EVERY news story to a bearish slant, I'm still not going to play that game. If I end up writing just for an audience of one.... myself... so be it. I will call it bullish... when I see it bullish. If some of you can't cope with that... well, you know where to go. US equity indexes soared for a second consecutive day, sp +48pts @ 2061. The two leaders - Trans/R2K, settled higher by 1.6% and 1.5% respectively. Near term outlook is for continued upside into year end... and beyond. 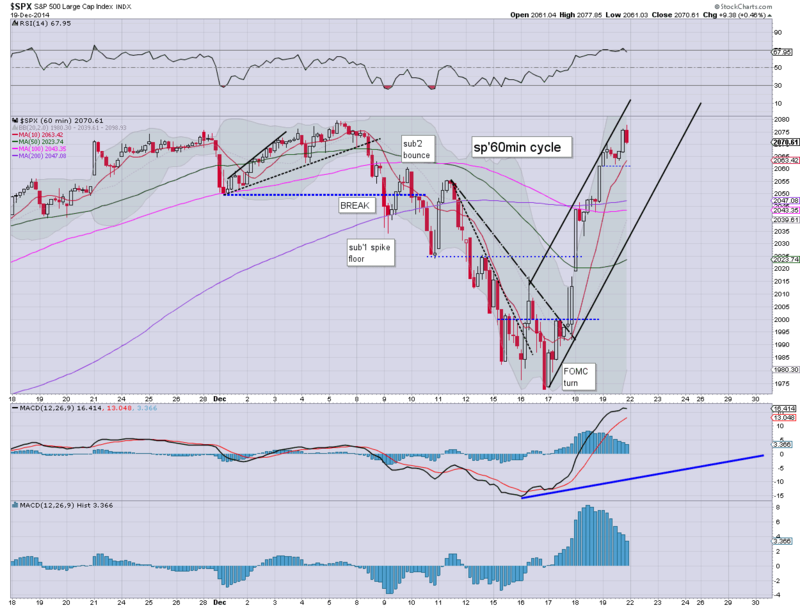 Suffice to say... powerful gains.. on day'2 of this new multi-week up cycle. New historic highs are coming for ALL indexes.. even the Nasdaq comp' (March 2000 bubble highs WILL be broken over). For the equity bulls.. this is an amazing way to end the year. For the bears.... its merely the resumption of the price action since spring 2009. *The R2K is due to get a 'golden cross' at the Friday open. A weekly close in the 1190s would be particularly bullish, and offer an attempt to break new historic highs (>1213) before year end.